There’s something about little girls and dancing that seem to go hand-in-hand. I know that my mom put me in dance classes about as soon as I started elementary school, and I loved twirling, kicking and stepping to the music. And my own girls are no exception. 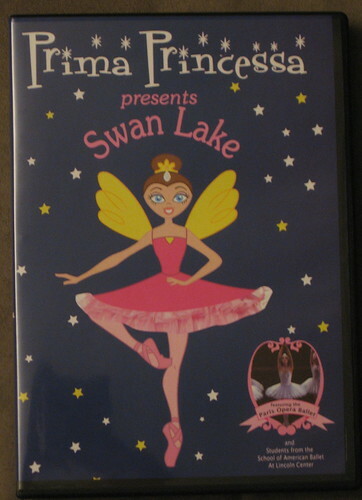 When I received the opportunity to review the Prima Princessa Presents Swan Lake DVD, I knew that my girls would love it. What I didn’t expect was how much they would LOVE it. This DVD is the project of two stay-at-home moms who, inspired by their children’s love of dance, teamed up (despite no prior movie-making experience) to produce it. It’s described as, “a hip new twist on learning about ballet, featuring the Paris Opera Ballet and Students from School of American Ballet at Lincoln Center, Official Academy of New York City Ballet”, and as “a cool, fun, beautiful show with a brain”. The 40-minute DVD features an animated fairy ballerina who takes viewers on a journey to see the Paris Opera Ballet perform select segments of Swan Lake. In between acts, basic ballet steps are shown and there’s an opportunity for kids to get up and dance along to the colorful montages of toys, animals, children and dancers from the School of American ballet. My daughters and I were enchanted by this DVD from the very first moment. The ‘Prima Princessa’ character is fun, cute and engaging – and does a very good job of narrating the ballet scenes for viewers who aren’t familiar with the story of Swan Lake. I haven’t seen the ballet myself – and and the narration really helped to bring the story to life. I also think that my daughters would probably have grown bored of just ballet scenes (as lovely as they are) after a while – but the narration, and the breaks between acts where they could get up and dance themselves, make a huge difference in keeping them interested and excited to watch. Even my 2-year-old wanted to join in and dance with her sisters. So many movies and videos nowadays just involve passive participation or don’t necessarily do a good job of inspiring kids to actually get up and move. This one not only successfully gets kids moving, but it also introduces them to the world of ballet and educates them on a few simple ballet terms and steps as well. The ballet scenes tell the story of Swan Lake, and also show kids what ballet is really all about – telling a story through dance. I can see children of all ages enjoying this – and although it’s geared more toward girls, there are boy dancers featured in the School of American Ballet segments, and in Swan Lake itself, of course. I can see boys dancing along right with the girls as well. The DVD is available in specialty stores nationwide and on Amazon . It retails for $19.99. For more information, please visit www.PrimaPrincessa.com. Enter by leaving a comment on this post and tell me who in your family would love to watch and dance to this DVD. Please don’t just say ‘choose me’, or your entry will be discarded. The contest will run until Saturday, August 16th at 11:59 pm EST. The winner will be selected through random drawing, contacted by e-mail, listed on this post and also submitted to PRIZEY.Fetch. Please leave a valid e-mail address or other way to contact you! If you don’t wish to leave your e-mail address, please make sure that you leave a unique name and check back with PRIZEYWinners to see if you won. If the winner hasn’t responded within 3 days, an alternate winner will be chosen by random drawing. If you’d like an extra entry or two, you can either subscribe to my RSS feed (click on the orange icon in the upper right sidebar), or mention this contest on your blog with a link back to this post – or both. Please leave an extra comment on this post for each of the extra entry options that you choose, letting me know – for a total of 3 comments if you do both extra entry options. Congratulations to Anne (no blog) who said, “I would love to give this to my neice, Katy! She is just the right age and would love this DVD. All of my girls loved taking “ballet” lessons when they were young! Thanks so much!“. I will be e-mailing you soon to work out the details.